This hotel is in the 16th district of Paris, within walking distance of the Champs Elysées and the Eiffel Tower. It offers air-conditioned rooms with satellite TV and private bathroom. 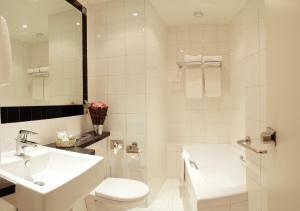 Each room at the Etoile Trocadero also features a minibar, a hairdryer and dry-cleaning service is available. A continental breakfast is provided every morning and can be served in the guest rooms. Guests arriving late can benefit from 24-hour reception and they can also leave their bags during the day. Daily newspapers are provided, along with Wi-Fi access. The hotel Etoile Trocadero is a few minutes’ walk from Trocadero and Boissière Metro Stations, leading directly to Montparnasse and Saint-Lazare Stations, the Opéra Garnier and Republique Square. A computer and a printer are at guests' disposal at the reception. Please note that the credit card used to reserve the accommodation will be requested upon arrival. If the guest staying at the hotel is not the same person as the cardholder, a copy of the cardholder's ID will be requested. When booking 6 rooms or more, different policies and additional supplements will apply. Guests are required to show a photo identification and credit card upon check-in. Please note that all Special Requests are subject to availability and additional charges may apply. Rate: € 82.00 ... € 201.69; select dates below to get current rates. With cable and satellite TV, this room offers a seating area and a private bathroom. This triple room has a minibar, seating area and satellite TV.